SAN ANTONIO - The 41-year-old man who was shot multiple times by a San Antonio police officer early Thursday morning reached for a handgun and drove his vehicle at the officer before being shot, according new information released to KSAT.com. Shortly after the shooting, Assistant Police Chief James Flavin provided preliminary details on the officer-involved shooting, but the newly released police report obtained by KSAT.com is shedding light to what led the officer to firing his weapon. Officers were responding to a report of a theft around 1:30 a.m. Thursday at a 7-Eleven on the corner of Culebra Road and North Zarzamora Street. 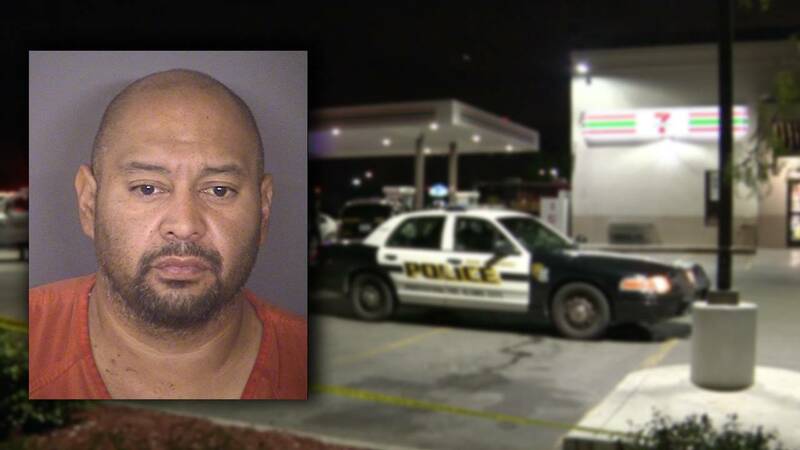 There, two SAPD officers found the man, Augustine Gutierrez, standing near the driver's side of his 2012 Hyundai, which matched the description of the thief's vehicle. According to the report, Gutierrez ignored the officers' commands to move away from the vehicle and instead got inside and started revving the engine. Flavin said that's when Gutierrez yelled at the officers, "Go ahead and kill me!" The police report said an officer fired his Taser gun twice after Gutierrez refused to get out of his vehicle. When officers tried to pull Gutierrez out of the vehicle, one officer said she saw Gutierrez reaching for the the backside of a handgun that he had in his waistband. After pulling away from the officers, Gutierrez began revving his engine once more and put his vehicle into drive. Both officers drew their guns while continuing to tell Gutierrez to get out of his vehicle. When Gutierrez tried to drive away from the store in the direction of one of the officers, the officer fired several shots, hitting Gutierrez multiple times. "(Gutierrez) intentionally lurched the vehicle forward placing (the officer) in fear for his life and safety of the others in the parking at the time of the incident," the police report said. Gutierrez was transported to University Hospital where he underwent surgery and was later discharged on Sunday. According to the report, police found a Smith & Wesson 9mm handgun in Gutierrez's waistband. Gutierrez is charged with aggravated assault against a public servant and felon in possession of a firearm. His bail was set at $115,000.